Visitors to residential estates are a regular, daily occurrence, so learning how to effectively handle their entry and movement throughout the estate’s grounds is critical. There needs to be a balance between ensuring that the security of residents and tenants is upheld, but without unnecessarily hindering the passage of visitors, employees and contractors. Hi-Tech Security Solutions looks for the solution to this thorny issue by chatting to some industry visitor management veterans. A good visitor management solution can be used in a court of law as corroborating evidence. It not only helps prevent crime, it also makes a statement to anyone wishing to visit the complex, as well as to criminals. Furthermore, it will greatly enhance overall estate security while helping minimise opportunities for criminals. According to Mark Paynter of the Terpay Group, the question of denying access to a visitor if they refuse to cooperate with regard to presenting a driver’s licence raises often-asked and important points which have several relevant considerations. The legal onus is on the estate to ensure compliance with legislation as well as with relevant commercial agreements with insurers and other service providers. Property managers and contractors could be held individually or jointly criminally and/or civilly liable for failure to comply with legislation, especially in the event of death, injury, or loss. “An even lesser known fact is that in terms of the Occupational Health and Safety Act, incorrect visitor register entries could potentially mean a criminal record as per Section 39. (4). Body corporates/trustees/security companies therefore have several obligations in terms of the occupational health and safety act, the sectional title act, and in terms of their public liability insurance cover,” says Paynter. “These obligations, logically, should override and supersede visitor comfort, satisfaction, or ease of access. So first and foremost, they need to ensure that they are not putting the estate and the residents at risk due to a non-compliant process or procedure,” he adds. In summary, the trustees can legally and should regulate visitor access to the common property. At worst, the widely acknowledged ROAR (Right of Admission Reserved) applies and can be enforced. John Powell of Powell Tronics says that generally, if an estate is private property and right of admission is reserved and is clearly stated in their constitution, then they can enforce specific rules like forcing contractors to be certified through their security process before they can do any work on site. Dave Rampersad of SNIPR South Africa adds that in general, estates should erect signboards that clearly indicate that the right of admission is reserved and that the driver’s licence and vehicle registration plate and disc will be captured as they enter the premises. He continues that the majority of the market is still using the intrepid visitor book, but in order to ensure speed and efficiency with visitor management, it is important to go the electronic route. This not only allows the estate to verify the visitor’s details, but it also mitigates risks. He explains that the system SNIPR uses does not capture the information on a driver’s licence, but rather scans the barcode and decodes the information thereon in terms of the person’s name, surname, ID number and photograph. The GateBook visitor management system also scans the vehicle licence disc and will highlight if the vehicle has been used in a previous crime or has been flagged as suspicious, should their SNIPR module be added to the device. Powell says that the most efficient way to speed up the processing of visitors is to use features like the one found in PT-Guest, which allows for the pre-authorisation of visitors. On arrival the visitor simply has to be verified by the security staff and linked to the host they are visiting and the correct data is then quickly acquired by portable units that can decode the driver’s licence of the visitor as well as the vehicle registration details. This alleviates the time that the security guard would typically need to gather information from a visitor and to contact the host. A similar process is followed for contractors, whereby the verification and management process would apply to allow access for the contractor for pre-specified scheduled times for precise hours and dates. At any other times outside these times, a pre-authorisation override would be required from a host. Once the visitor has been verified and has passed through the entrance gates, how does one track their movements? This, says Rampersad, is rather challenging for most residential estates to find a cost-effective solution, as while it is possible to see where they enter and leave an estate and where they are supposed to be going with traditional surveillance monitoring systems, the routes in-between these points do not always have surveillance and may not be set up strategically to track vehicle movement and irregularities. However, says Powell, it is possible but the proviso is that you have additional access points within the estate. Therefore, there will be a primary entrance gate then secondary areas that give access to common areas like golf courses, gyms, clubhouses etc. Using a zone occupancy report one can see what zone the visitor last accessed. Pedestrian traffic heat mapping and tracking can be done using intelligent Wi-Fi signal analytics in conjunction with an estate-wide Wi-Fi mesh network. This solution would be complementary as opposed to primary, and would bolster the intelligence of other systems. It cannot provide faultless tracking of all visitors, as many would not have Wi-Fi enabled and device signal strengths are not an exact science as there are many factors which create variables in terms of signal strength and quality. It is in the best interests of all stakeholders that everyone works closely together to gather information on known criminals as well as vehicles that have either been used in crimes or have been stolen. SNIPR South Africa is an early warning system that uses ANPR (Automatic Number Plate Recognition) technology to recognise number plates and cross reference this across its global database of suspicious vehicles which includes subscription to the national law enforcement database of suspicious vehicles. This technology relies on strategically placed cameras or GateBook handheld devices at entrance points or high valued areas. This database of suspicious vehicles is extremely useful in providing estates and other stakeholders with the necessary information to identify these vehicles and issue alerts. Rampersad says that the company has over 140 trusted vetted and verified sources that provide information for its national live database. Once a number plate is received by the SNIPR server, it is cross referenced to the plates on file and on the law enforcement database. 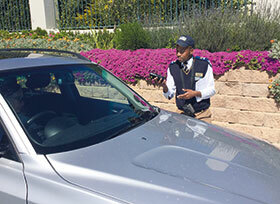 If it turns out to be a suspicious vehicle, the security teams at estates will be prompted in the control room and on the app via their mobile device to take the relevant immediate action. “I strongly believe that it is time for the private sector to work together more strategically in a more coordinated way, to gain the upper hand against violent crime. There are many ways this can be done,” says Paynter. They include centralised rule driven data. This is technology which references a unified database of identities as well as high-risk ID numbers, vehicles and cellphone numbers is far more powerful than technology which does not check the visitor data against anything. Powell says that in addition to an integrated solution such as PT-Guest, the company also has a standalone visitor management system called PT-Scan. This cost-effective system is ideal for smaller to medium-sized estates and allows users to replace the manual visitor book with an electronic solution by scanning the driver’s licence and vehicle registration. PT-Guest has a full bouquet of features such as pre-authorisation, in-zone reporting, late exit of contractors and is fully integrated with access control systems, linking the homeowner with a pre-authorised guest and allotting time zones to visitors. PT-Guest also provides a web interface where registered authorised persons can log in via email and a password, and can request single or multiple access packs for visitors. Standard and custom management reports are available. SNIPR’s GateBook Access app is another pre-authorisation method that sends a PIN to a guest and stipulates how many guests are permitted to enter when the security guard scans the PIN. Similarly, when contractors are entering premises, the system takes a photograph of the guest and scans the vehicle registration. • Every identity transaction must be ‘live’ screened in real-time and not in retrospect. • Visitors’ identities must be verified to check that they are who they say they are. • Identity sample must be kept for evidence of permission and presence – fingerprint/photo/DNA. • Must comply with legislation – PoPI, ECT, OHSA Acts. • Secure offsite cloud hosting of data – secure compliant backup. Lower data theft/tamper risk. He adds that a system which merely records the persons ID or vehicle disc without any cross checking or verification has several vulnerabilities. It is therefore important to use a system which can perform a live ID check to ensure that visitors are who they claim to be. Electronic visitor management is a rapidly evolving technology. However, for various reasons, including budgetary constraints and ignorance of benefits, many estates are still deluded into believing that the inaccurate and highly inefficient manual visitor book is sufficient to control and monitor visitor access to estates. Given the ability to verify visitor identities, thereby eliminating criminal elements having access to private premises, the shift to electronic alternatives should be a no-brainer for estates. The return on investment is proven across a wide footprint of success stories and dubious estate mangers and HoA’s should take the time to visit estates where residents are reaping the benefits of adopting the technology. Powell Tronics, 0861 787 2537, marketing@powelltronics.com, www.p-tron.com. SNIPR South Africa, +27 (0)71 887 3619, dave@snipr.co.za, www.snipr.co.za. Terpay Group, +27 (0)74 566 3663, mark@terpaygroup.com, www.terpaygroup.com.